A new year is upon us, and with it annual plans with new key initiatives for 2018. While you are crafting and executing your plan, so are your competitors… how will your plan succeed in light of their efforts? What if you knew where they were going to invest so you could get ahead of the game with your own strategy? There are signals hidden everywhere that allow you to pick up on your competitors’ investments. Here are a few places to start to unearth their 2018 strategies. 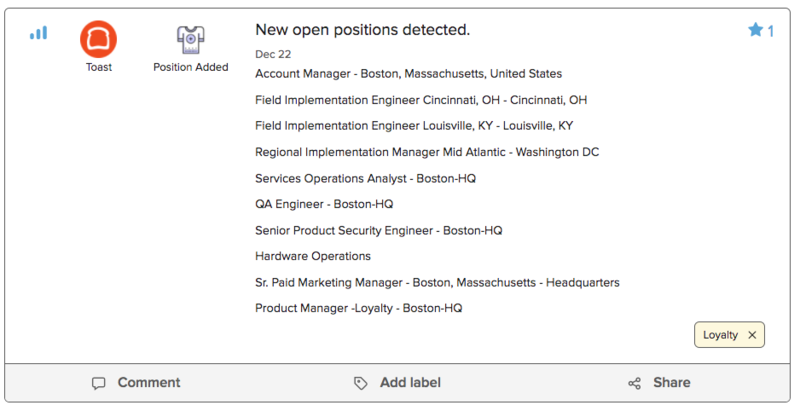 Job postings are a great place to see where a company is planning to invest, and find unique details you won’t see publicly available elsewhere. For example, this list of new jobs posted by Toast, a restaurant POS company, shows growth in account management, field engineering, and a few other areas that seem part of normal growth. But if you look even closer, you see an opening for a product manager focused on loyalty programs. Do they already have a product in this area? Do they have a product manager dedicated to this product line? If not, this shows a new focus on this direction in the new year. Sometimes it’s not just the opening that can provide intelligence, but rather the details of the job description that uncovers unique information. For example, Intercom, a customer messaging platform, posted a series of engineering openings on various teams. At first glance, this doesn’t seem out of the ordinary - they have an existing engineering team, and these roles fit right in. But if you look closer - into the specifics of the job description - you can find a lot of internal information. 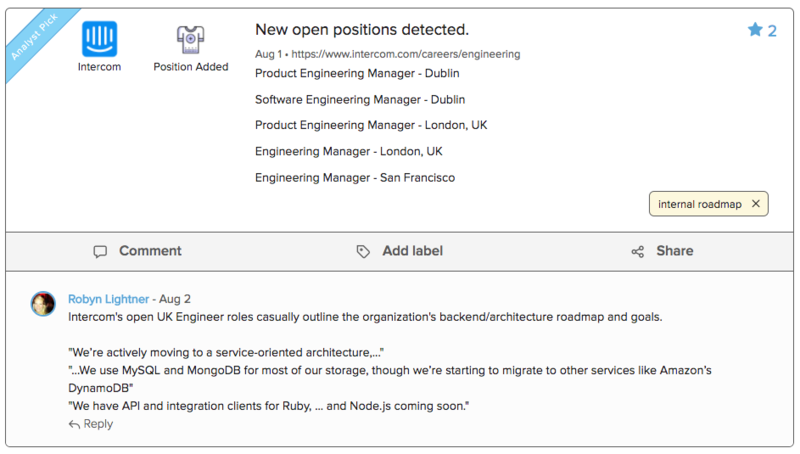 This job description notes details about a change in backend architecture that’s coming, including details on data storage and integrations. Companies will often divulge more details in job descriptions than they would otherwise volunteer on their website, so they can be a great source of intel. Before a big product launch or shift, it’s not unusual for a company to prime their marketing with some content on the same topic. Content and social media can be easier to produce ahead of time, can start to build inbound interest and thought leadership, and can create a base of content to reshare post-launch. Because of this, a new topic covered in content - such as blog posts and ebooks - or social media - such as Twitter or Facebook posts - can signal an upcoming launch. 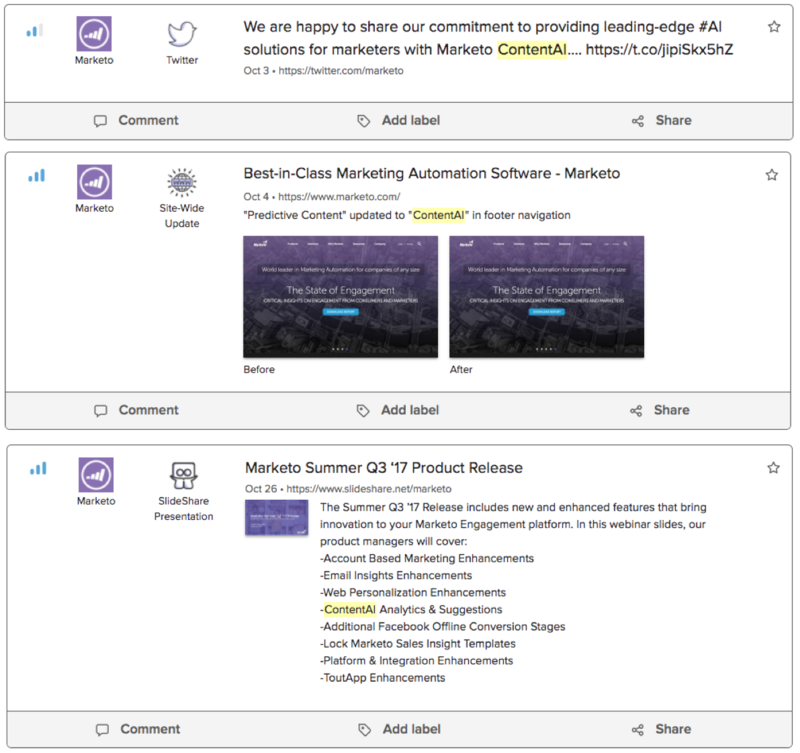 Take, for example, this lead up to Marketo’s launch of their ContentAI product, which was more like a rebranding of a Predictive Content product feature. Leading up to the launch, there was an increase in social media posts on the topic of artificial intelligence (AI). 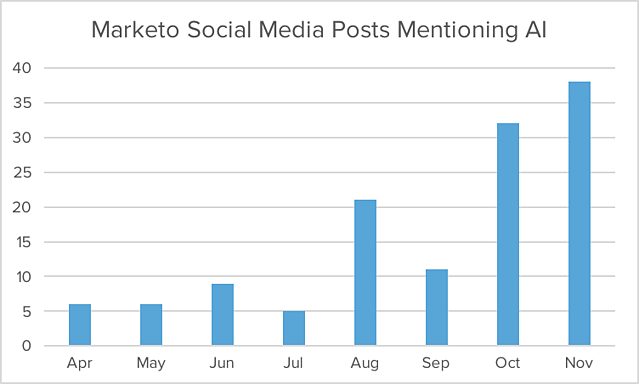 Essentially, we had a couple months’ worth of warning that Marketo would be investing more into this area. And we saw that culminate in a product launch in October and continued rollout investment through November and December. Pay attention to new topics - or even personas or verticals targeted - in content and social media posts from your competitors to get early warnings of upcoming launches. Many companies turn to A/B tests to flush out future changes in their marketing campaigns, product packaging, and more. If you have a way to capture these tests, you can get a peek into their hypotheses around what will bring in the most customers, and get an early warning about what they may lead with once the test is complete. 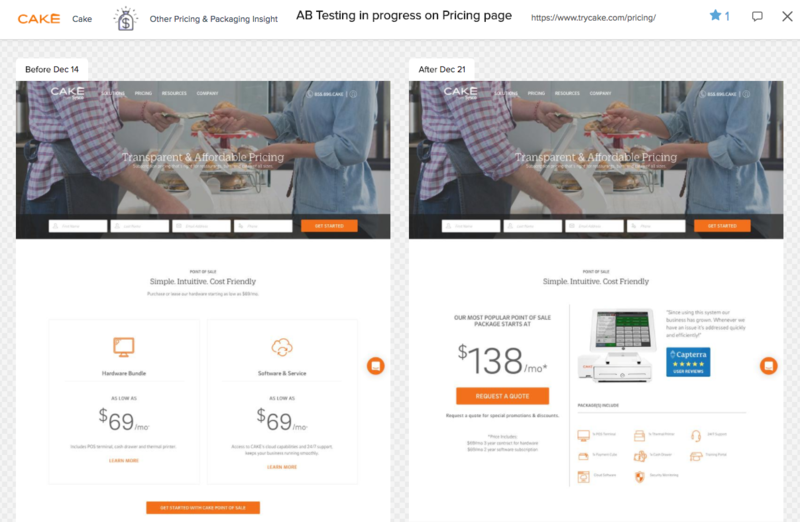 This example of POS company Cake’s A/B test on their pricing page shows that they’re testing a new product package that bundles hardware, software, and services. This could signal a hypothesis that simpler pricing will convert better, or could be a sign that they’re using bundles to achieve another goal - like longer term contracts (mentioned in the fine print). By digging into the differences between the pages, we can find a few potential scenarios to analyze. Subtle but wide-reaching marketing changes can also signal a broader strategy. Swapping items in the navigation or changing a word in a set of headlines can let you know a lot about what a company is prioritizing in the new year. Recently, a few companies in the customer service software industry made some site-wide changes. Freshdesk added “Apps” to their top navigation - a potential signal that they’re increasing investment in integrations and an app marketplace. Salesforce replaced a “Resources” link with a “Customer Service Content Hub” link - a potential sign that they’re further investing in customer service-specific content to support that product’s growth. Together, these hidden signals can help you decode your competitor's strategies to better plan your own efforts this year. How will you adjust your approach given a competitor's new product line investment, vertical focus, packaging change, or go-to-market plan? The signals are there, it's time to uncover them and outline a proactive strategy.